In this post, you will find the current legislation for the use of drones in New Zealand. Maximum altitude: In New Zealand, drones can fly up to 120 meters (400 feet). Maximum horizontal distance and FPV: You must always be able to see your drone with the naked eye during the flight. If you want to do FPV flights, an Observer can also watch the copter. Compulsory insurance: Currently, I know nothing about mandatory coverage for drones in New Zealand. Nevertheless, I recommend everyone to insure his copter. Maximum take-off weight (MTOW): Private drones should weigh no more than 25 kilograms in New Zealand. Distance to airports: In New Zealand, a multicopter may approach a maximum of 4 kilometers to an airport. No-fly zones: In the National Parks you have to contact the DOC (paying ~ 56 NZ $) and in other public areas you need permission from the City or District Council. Operating hours: In New Zealand drones may only be used in daylight. An exception can be made if you fly within 100 meters of a hill (for example, a tower, a church) and do not rise higher than the elevation itself. Then it can be assumed that no other aircraft is flying so close to the survey. In New Zealand, one speaks of a shielded operation, for which no further conditions are to be fulfilled. Requirements for commercial pilots: New Zealand does not distinguish between private and business intentions. 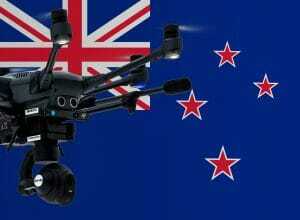 We have researched the listed drone regulations for New Zealand to the best of our knowledge. We cannot guarantee the correctness of the information. If you want to be on the safe side, contact the competent aviation authority. Alternatively, you can also ask the embassy in your country for further information about the regulations. Please leave us a comment when you receive news and/or gain experience with your copter in New Zealand! Hi, I am really happy to see the exact thinks which i was looking for. I have some personal questions. I have a mavic air and planning to take a trip to south islands New Zealand. can you please suggest some good places that I can fly legally or getting councils or doc approvals without much hassle. I am visiting NZ again but on this occasion I will be bringing my DJI Spark. Many drone owners will know this is a very small drone with an all up weight of about 300g.. It appears looking through the maps that there are too many safety regulations where one cannot fly in a scienic national park or pretty much anywhere where pilots are flying low level and you should contact the CAA to let them know you are there. I hope this is just to make you aware of other activity but not to spoil ones enjoyment.